Foyers are important features in the home. They are the first thing we see once we enter a house. Some are grand. They can hold their own. Others are tinier but they are also a feast to the eyes. Big or small, accents and embellishments only make them more impressive. This is where the Foyer room gallery comes in. 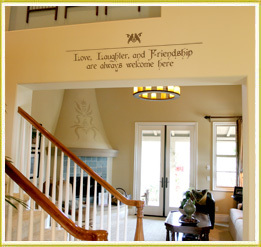 It encourages the use of the wall spaces around the foyers by ‘dressing them up’ with wall decals. If you are looking to style up your foyer, you are at the right place. 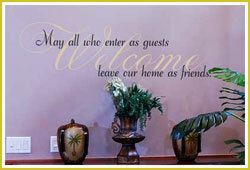 The wall lettering we have used in the foyers shown come in different sizes to fit every foyer. 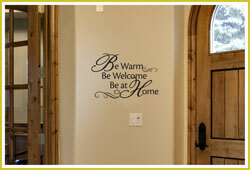 The ‘Be warm, Be Welcome’ wall words have found a home in a small foyer. They are on a wall that is between a wooden arched entry door and a similar panel door leading to another room, probably the living room. 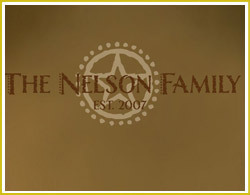 The wooden doors are warm and create a welcoming atmosphere. 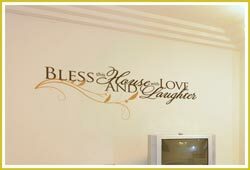 The beige underlying wall is an excellent complement to the black colored wall letters. This works well for small spaces: Clean, crisp lines that make the foyer feel bigger. 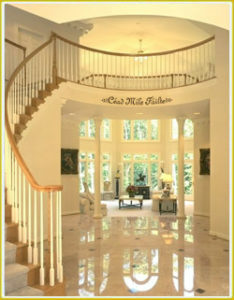 For the bigger foyers, we have used long and wide wall quotes so that they do not disappear in all this grandeur. Note the colors used. They are darker than the underlying wall so that they are visible and easy to read. The fancy ends and lettering style make them look so attractive! Wall words above the television: one cannot help but smile at the humorous undertones. A rare sight indeed but it does work with the rest of the décor! They are a combination of two lettering styles of which one is very festive. This sets the mood in this television room: TV watching is a fun affair! Cap this look with an embellishment that is just so classy and the mood in this room is elegant but fun. This is the way to go! The custom monogram is just perfect for the foyer. It immediately clears any doubt as to who owns the place and whether you are at the right address! This identification method has been around for ages. It never goes out of style! 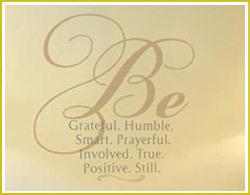 If you are looking for wall quotes that will last and last, monograms are the answer. You may wonder how long it took to put the wall quotes up. After all some of these foyers are massive and look like one needs many tools to get the job done. Well, it only takes ten minutes from the start to finish and the job is a done deal! No tools are necessary, except a ladder should you wish to put the wall letters on those hard to reach places. Peel and apply sums up this job well. 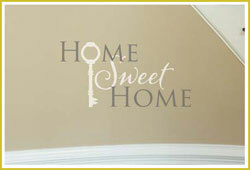 Wall decals are easy to put up and they do turn that foyer into an amazing entry. They are also easy on your pocket. One is therefore able to add some elegance cheaply.